Today, Earth Day, the signing of that resolution was celebrated in front of City Hall by the Mayor alongside City Clerk Judi Heron. “The resolution is designed to inspire the confidence and optimism that we have in Menlo Park to focus on climate solutions at the scale needed to address the magnitude of the climate crisis we are facing,” explained Diane. “Our City and region have taken many great steps, from the formation of Peninsula Clean Energy, to new building standards and the implementation of electric vehicle charging station requirements, to move the needle on the reduction of greenhouse gas (GHG) emissions,” said the Mayor. 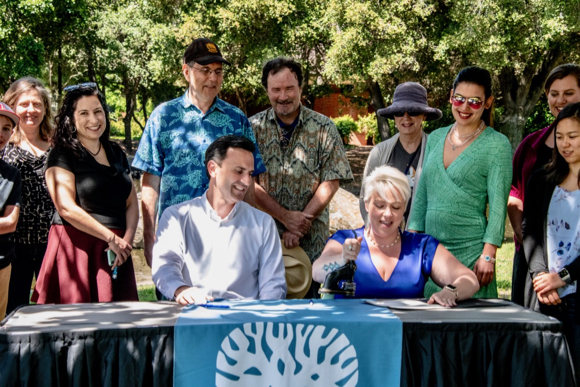 “We have accomplished so much, with the commitment of our professional staff, the leadership of our Environmental Quality Commission and in partnership with organizations like Menlo Spark, the Sierra Club, Green Foothills, our property owners, stakeholders, and residents. Climate Goals: Adopt a new Climate Action Plan that accelerates a near term transition to carbon neutrality, maximizes GHG reductions by 2030, spurs innovation and creates jobs, and prepares for the impacts of climate change on public health, infrastructure, the economy, ecosystems, and public spaces in our community. Smart City Planning: Incorporate climate and sustainability into all city policies, programs, and plans. Public Outreach & Benchmarking Progress: Increase public outreach on the city’s community-wide sustainability and resilience efforts, including regular reporting on progress towards GHG reduction goals, actions, and policies. Equity: Recognize the needs of all community members through environmental and social justice, and a commitment to create equitable investment, planning, and services for a more cohesive city of Menlo Park. Sustainable Mobility: Implement transportation policies that eliminate carbon pollution and reduce congestion, creating more convenient and safe options for bicycling, walking, and riding public transit, while supporting a transition to electric vehicles. Zero Carbon Buildings: Ensure that new homes and buildings are built with Zero Carbon electric heating and appliances, and work with regional partners to explore programs that assist home and building owners with upgrades that phase out fossil fuel use. Healthy Neighborhoods: Discourage the use of toxic chemicals among homeowners and businesses, including pesticides. Preserve the Landscape: Protect open space and natural resources as a part of the climate action plan and adaptation strategy.